Science and Engineering Community of Practice (Lead: Nirav Merchant) – This group summarizes feature requests and user requirements across the participating science and engineering domains. New user requirements are approved by the executive committee, and then sent to the Technology and Research community of practice for implementation. Technology and Research Community of Practice (Lead: Arcot Rajasekar) – This group coordinates design and implementation of new features within the DFC middleware. The NSF OCI-1032732 grant “SDCI Data Improvement: Improvement and Sustainability of iRODS Data Grid Software for Multi-Disciplinary Community Driven Application” is the primary developer of extensions to the iRODS data grid technology, and provides standard releases of the iRODS technology. The Technology and Research community of practice coordinates with the SDCI grant to ensure features needed within DFC middleware will become part of the standard iRODS releases. Facilities and Operations Community of Practice (Lead: Chris Lenhardt) – This group manages the DFC federation hub, updates the system to new software releases, provides user support, and supports federation with external data grids. 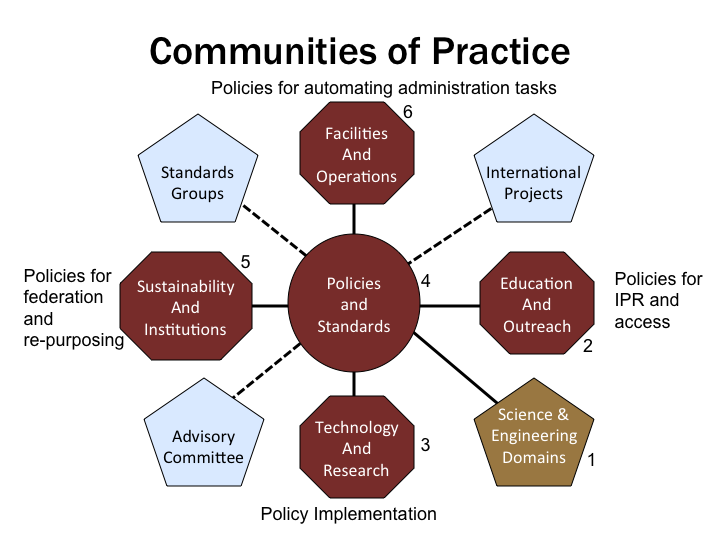 Policies and Standards Community of Practice (Lead: Helen Tibbo) – This group surveys the user communities to identify policies that are required for governance of data collections, and for user requirements. The long-term goal is the identification of standard policies that can be used by science and engineering domains to manage data collections. Education and Outreach Community of Practice (Lead: Andrea Chiba) – This group is funded in 2014-2016 to coordinate educational outreach activities between the DFC Federation and the participating science and engineering domains. Current activities are supported by SILS through the LifeTime Library initiative which supports student digital libraries. Sustainability Community of Practice (Lead: Reagan Moore) – This group is funded in 2014-2016 to explore mechanisms for long-term sustainability of the data infrastructure, and support re-use of data collections.